I never had the luxury of playing this game when I was a kid, but that didn’t mean it wasn’t on my Christmas wish list each year. 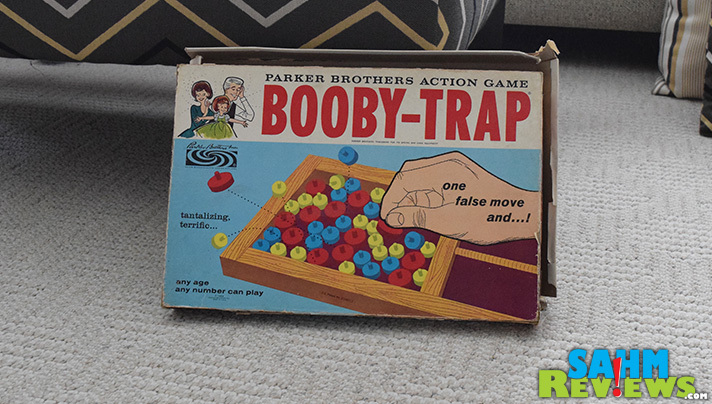 I remember seeing commercials on Saturday mornings for Booby-Trap, but never was ‘good enough’ for Santa to bring it. Or so that’s what mom told me… I’ll finally have the last laugh as we found a copy at our local Goodwill for under $2. And although I knew I’d include it in our Thrift Treasure series, I would have purchased it anyway. 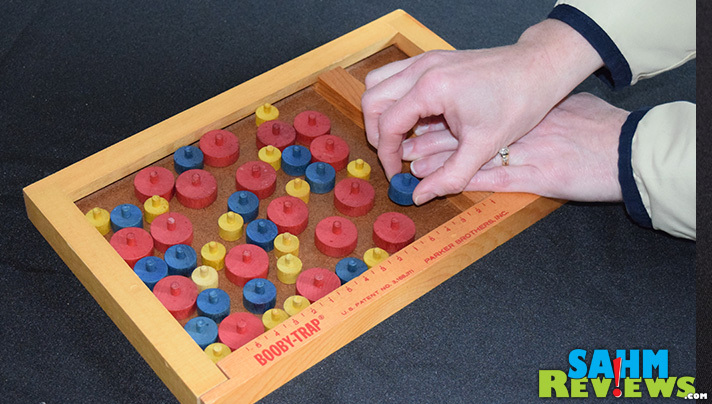 Originally issued in 1965, our Parker Brothers copy is one of these early version. The box has had a rough life and there are probably a couple pieces missing, but the game itself is as good as new. 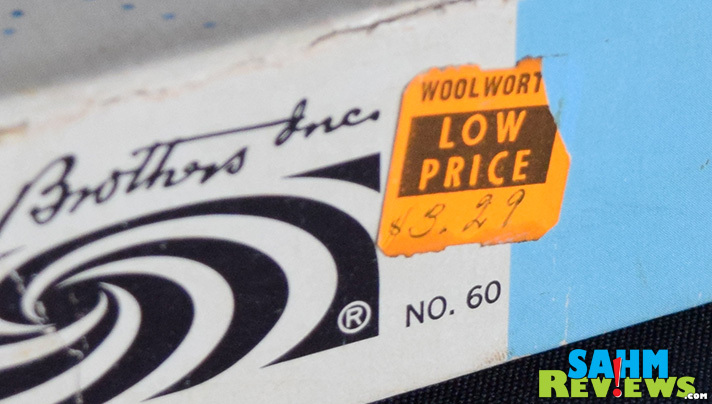 In fact it still sports its original handwritten Woolworth’s price sticker of $3.29! 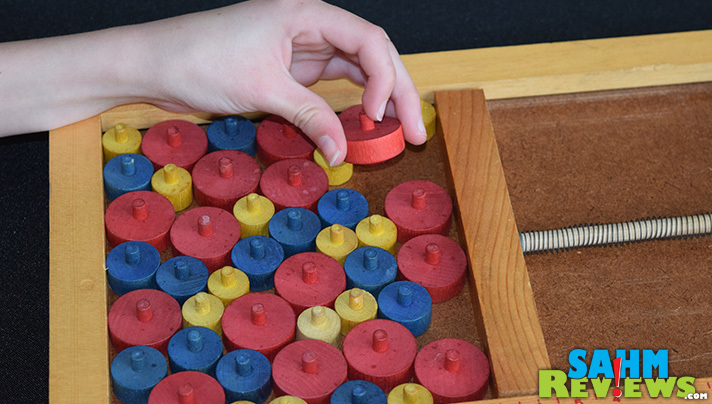 To set up the board, you put all of the wooden discs and compress them by releasing a spring-loaded bar. This creates tension between all of the pieces that will shift when one or more are removed. 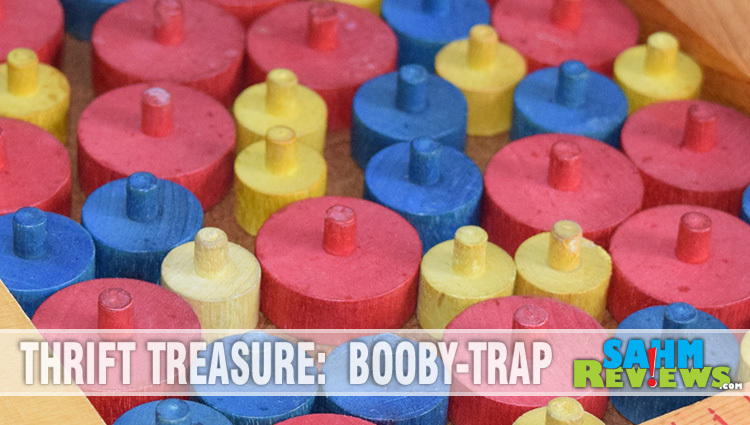 Booby-Trap is one of those game that requires a steady hand and a touch of daring like Operation. 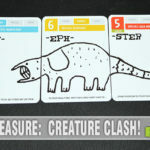 On your turn you must remove one of the discs from the game board, with the larger versions being worth more points at the end of the game. Once a player has touched a piece, he must either pass his turn or remove the piece. If he does remove a piece and the spring bar moves less than one of the spaces on the scale along the side, he has completed a successful play and keeps the piece. If the spring bar moves one or more markings, the player is penalized three points and the piece that caused the penalty is placed in a discard pile along with any other pieces that may have jumped out of the board or been pushed up on their sides. A player may pass as many times as he wishes so long as each person playing has not already passed twice in succession. If everyone playing has passed twice in succession, then on the third turn a player must remove a piece, even though he is certain that the spring bar will move. The game ends when there are as many pieces left as the number of players. The player with the highest score wins. 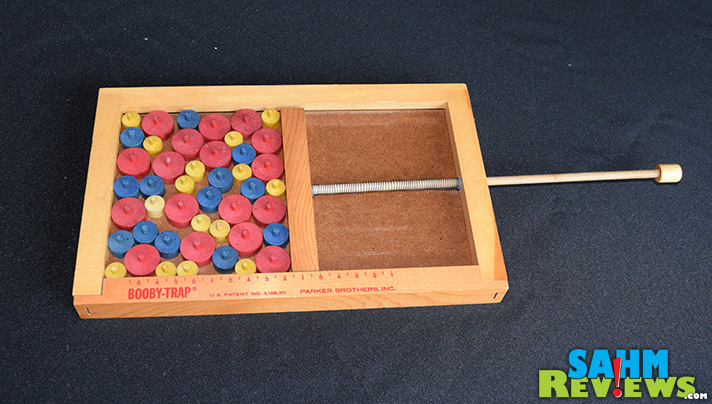 Booby-Trap was such a staple game in so many households that it was eventually issued by other companies under many different names. Mikado, Scree, Snap Trap and Squeezed Out are but a few of the dozens of known variations. You can still find brand new copies on Amazon for under $15 as well as used ones on eBay for a little bit less. Were you one of the lucky ones to own a copy as a child? Oh! I found one of these games at a garage sale for a buck, and I just love it! I can see why you longed for it as a little kid, it’s a treasure! 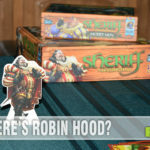 I never played it but my husband (we are both in our 60’s) played it a lot with his cousins. He didn’t own one but his cousin did. He remembered it right away, said he really enjoyed playing it. This brings back some fun memories! How cool that you found this. I am glad to know you can still buy this new too! I have never heard of this game. Looks fun though! I love heading to my parents house and finding all the classic games I grew up with. I might grab some to bring home to the kids this time. I’ve never seen this game before but it looks like fun! 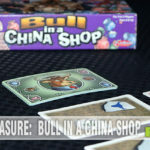 I love playing different board games- my husband and I are always on the look out when we go to thrift stores and have picked up some goodies over the years! I love all sorts of games, so this looks fun! And what a great deal you got! 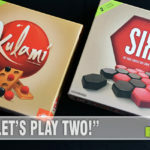 I never think to go to Thrift Shops for games – great idea!